Somewhere between Etro's Gomma and Knize Ten. More consistent and refined than the former but less powerful and compelling than the latter. 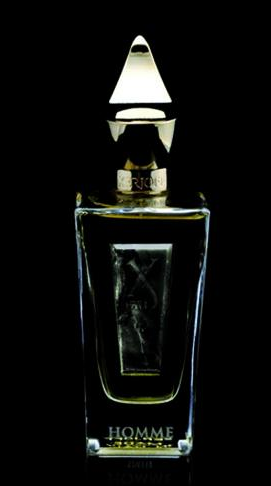 Xerjoff Homme is a butch and masculine leather prominent composition that opens with the same, characteristic gasoline note of the two aforementioned fragrances but where the Etro may result a little too literal in reproducing KT, the Xerjoff introduces a nice iris note to add some personality and soften the general harshness. Amber is clearly remarkable during the drydown but it's not as enveloping as in the Knize (which may be good news to someone). Sort of a manicured and polished version of the austrian masterpiece. Great projection and amazing lasting power. Personally I see no reasons to spend such big money to get a reproduction when you can have the original at 1/3 the price but, if by any chance, they will decide to discontinue Knize Ten, Xerjoff Homme will definitely become the only valid alternative.